Subcontractors - Design-Build Solutions, Inc. The Garland Industries companies have long-standing relationships with locally based roofing contractors whose work and financial status have been scrutinized to ensure best-practice standards of quality workmanship, fiscal accountability, and workplace safety. Garland offers classroom, video, and on-site training to familiarize crews with system application. In addition, contractors are monitored on-site regularly, and continually reevaluated to ensure they are meeting DBS standards of performance. 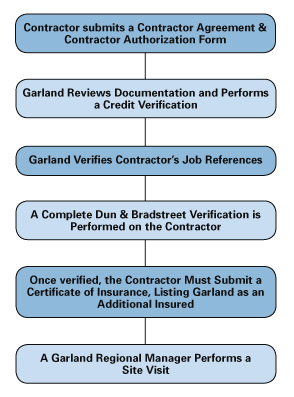 The Garland local contractor network ensures an even playing field in competitive bid situations. When you choose DBS as your construction partner, you can be sure that every contractor that bids on your projects has the labor, equipment, financial stability, and safety record needed, and is familiar with all local building code requirements.